Plant it, grow it, pick it – COOK IT! Cooking Ripe! has moved to: CookingRipe.com – please join us on the new site! The ghosts and goblins have retired for another year, but I bet you still have some sweet pumpkins hanging around the house or you have some frozen or canned pumpkin puree. If you’ve got some puree on hand, this is a super fast, super easy, and super flavorful meal the whole family will adore. You can make it as spicy as you like – or not – and you can get it on the table in a flash! Oh, and the nutritional content is simply amazing: all sorts of fiber from beans and pumpkin, lots of vitamins and it’s very low carb and low fat! 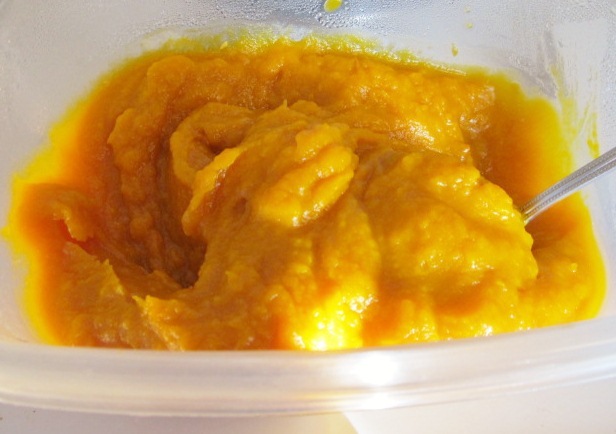 I promise (fingers crossed behind my back) this will be the last pumpkin recipe I’ll share – for a little while, anyway. I have almost used up all of my pumpkin from my little patch, so I actually bought four more little sweet pumpkins during the after-Halloween sale because I just can’t get enough! The Hubs rolled his eyes when we saw the new ones arrive from the store. “Oh… more pumpkin,” he said less-than-gleefully. Whatever. I love the stuff, so I’m going to keep roasting, pureeing and putting it in anything and everything. Hands up if you’re with me! 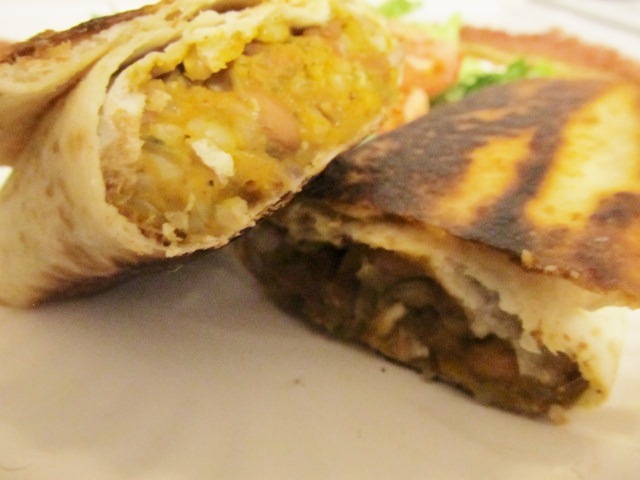 You might think that a pumpkin burrito would be sweet – which it could be if you made it that way – but these burritos are savory and spicy and definitely not reminiscent of pumpkin pie. I got the idea when I had a pumpkin burrito at a local hole-in-the-wall Mexican kitchen in Durango where the daughter now lives. 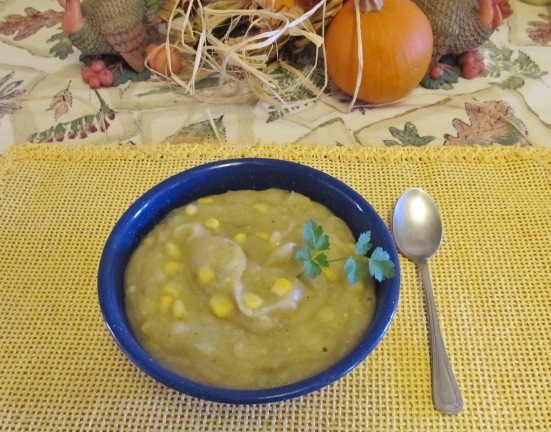 It was pretty simple: pumpkin and green chile, so I thought I’d whip up my own version of it at home. It’s really simple if you have some puree and some rice ready. I swear it was ready in about 15 minutes. I use a rice cooker, so I made some short grain brown rice earlier in the day. Then, simply saute the onions until translucent, then add the garlic and cook for a minute. Finally, add the rest of the ingredients to the skillet and cook over medium-low heat until hot throughout. If you let it sit a little while, the flavors will improve, but if you need to get the troops fed, just move it along. 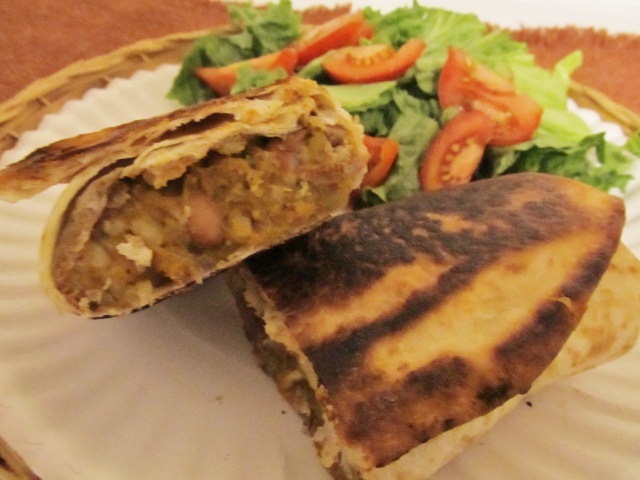 I decided to crisp the burritos in a little canola oil – not a total deep fry – to add a little crunch, but you could serve the burritos soft or you could pour some red or green chile enchilada sauce over the top for an “enchilada style” burrito. 1/2 cup chopped fresh cilantro (I used one of my frozen discs from this recipe) – skip if you are cilantro averse. Parsley’s always a good substitute. Heat a large skillet to medium-high heat. Saute onions until translucent, then add garlic and cook one more minute. 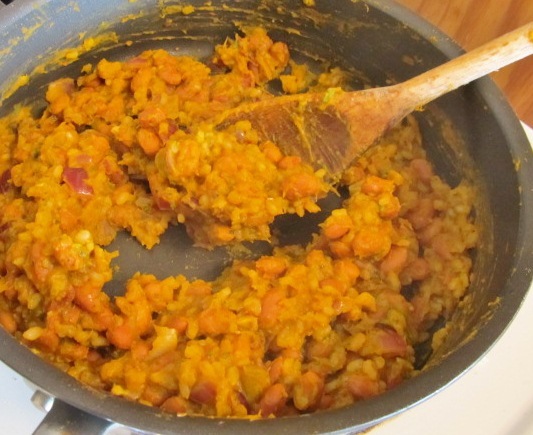 Lower heat to medium-low, then add pumpkin, beans, rice, green chile, spices, and cilantro. Simmer and stir until the mixture is hot throughout. Keep the heat fairly low so it doesn’t scorch or dry out. Spoon two large scoops of pumpkin mixture into center of a tortilla and fold ends towards center, then roll up from one side. 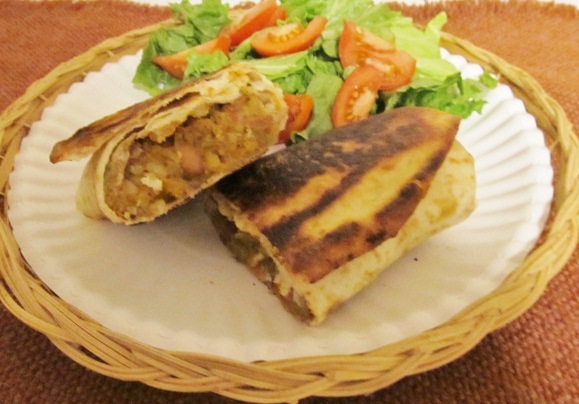 If you want to make crispy burritos, heat up about another skillet with about 1/2″ of canola oil over medium-high heat. Place burrito in pan, cook for a couple of minutes until golden, then flip over and cook the other side until golden. 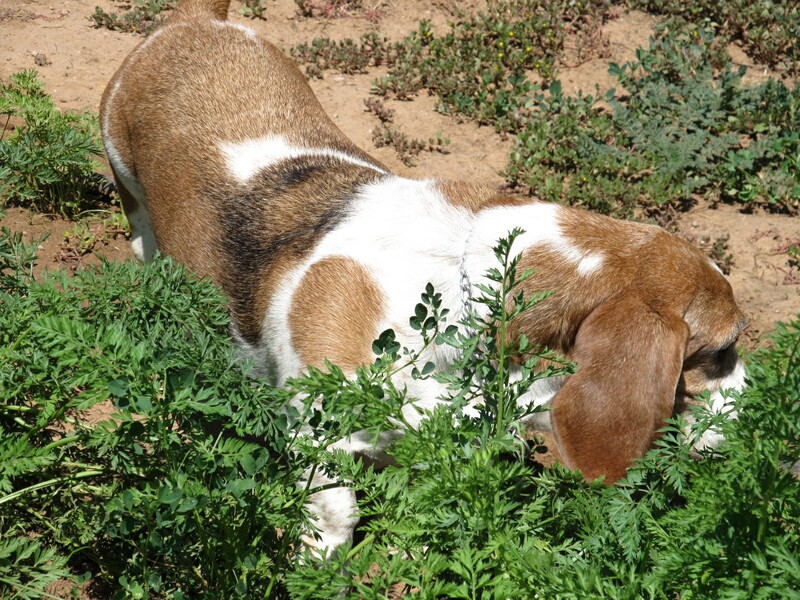 (Note that mine got a little overdone when I became distracted feeding the hounds – oops). Drain on paper towels. If you want enchilada style, spoon sauce over burritos, then warm in oven or microwave. These are pretty spicy, so dial back the chipotle and green chiles if you’re not a heat freak like me – or if you’re serving small children. The Hubs said they were a little too spicy for him, but it was just right for me. He would have enjoyed some meat, like ground beef, in his but overall gave the meal a thumbs up. He was surprised to learn that one of the main ingredients was pumpkin since it just takes on the flavors of the other ingredients. Notes for next time: this recipe is so versatile that the possibilities are endless – really. You could add some cooked meat, as the Hubs suggested: beef, pork or chicken would work. You could also use a simple taco seasoning combo instead of the spices listed above. Of course, you could use other types of beans – or a combo of more than one type. I might add some enchilada sauce inside the burrito, too. 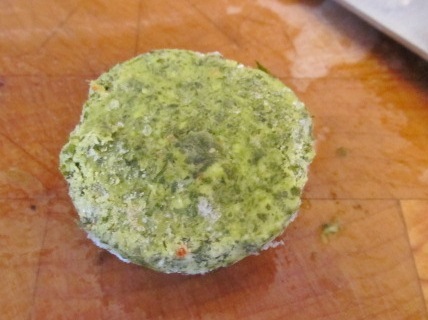 To increase the veg content, I might add some corn or spinach. Basically, anything you’d do to any other burrito, you could do here. I also think the mixture would be awesome as a tostada topper, too! PS: this stuff is even better the next day for a leftover lunch. Mhmm. I’d love to hear your variations on this simple recipe. Leave a comment! 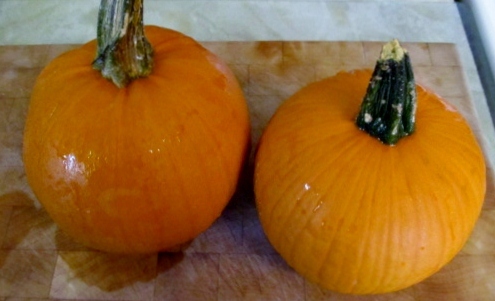 Follow my Pumpkin Board on Pinterest. Categories: Cooking, Dinner, Vegetarian, Veggies | Tags: autumn, cilantro, Cooking, easy, Fall, food, Harvest, Hatch green chiles, healthy, homemade, low-carb, low-fat, Mexican, pumpkins, simple, spicy, vegetables, Vegetarian | Permalink. I took a break from my pumpkin recipes long enough to cook up a new harvest meal. 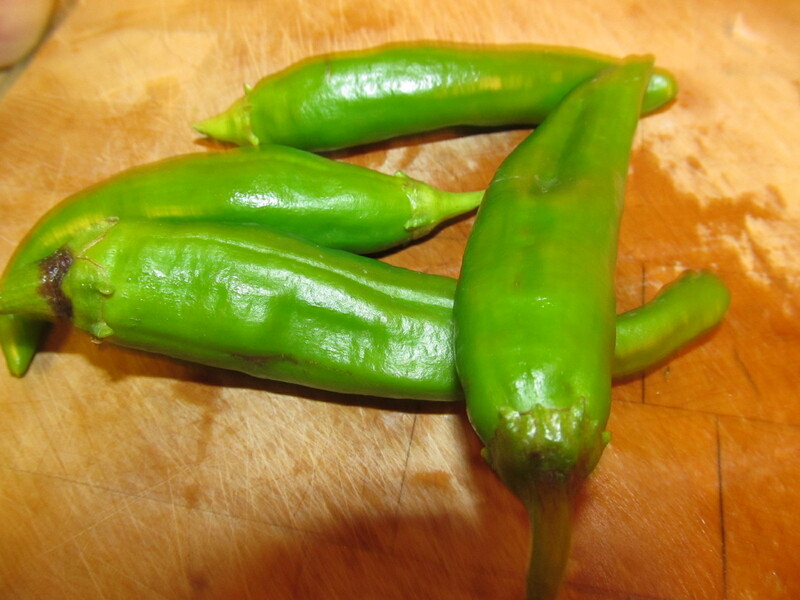 I’ve been thinking about a green chile soup since we roasted our Hatch green chiles last month (how to roast and preserve Hatch chiles), but hadn’t gotten to it yet. Then today I was thinking about an easy meal I could prepare early in the day so the daughter could take some home and then we could reheat later for dinner. 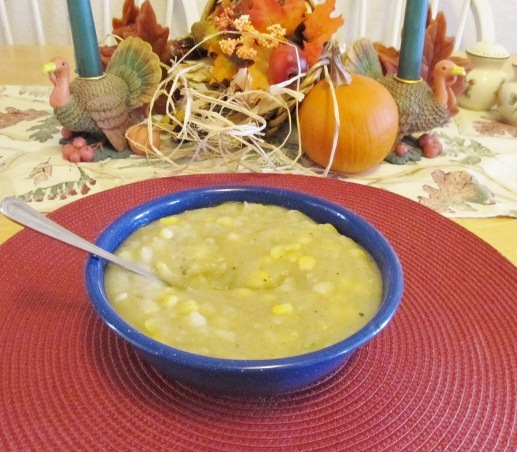 The daughter loves potato soup and since I got several ginormous potatoes in my Bountiful Basket yesterday, so I decided it was time to make a green chile and potato soup – or chowder. What exactly is the difference between a soup and a chowder? I didn’t know either, so I did a little research via Google. I learned that while the traditional definition of chowder is a thick seafood soup (ie. clam chowder), the modern definition seems to be a chunky soup thickened by potatoes, onions, milk or cream (ie. 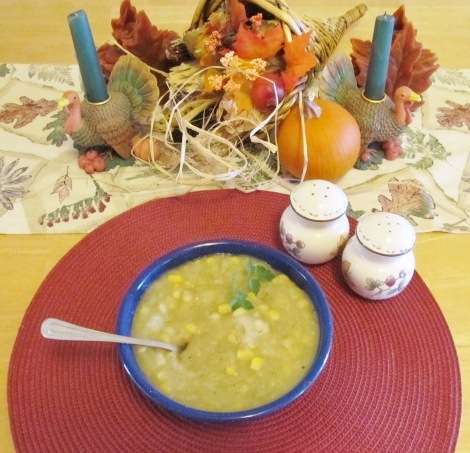 corn chowder). So, because I’m using potatoes to as a thickener I’ve decided to call this recipe a chowder instead of a soup (mostly because I’ve posted two soup recipes recently and I’m proving that I’m not in a rut). This is an easy, free-form recipe (like the rest of my recipes, right?). It came together pretty quickly and would make an easy weeknight meal. It’s also pretty healthified as we only used a tablespoon or two of butter and no cream, flour or milk – and honestly, I think you could skip the butter and it would be just as good! The daughter took home a container for her dinner and the Hubs and I finished the rest ourselves. The Hubs loved the soup, I mean chowder. He liked the heat and creaminess, but lamented that the addition of bacon or ham would have made it that much better. I rolled my eyes, but feel free to take his advice and add some cooked bacon or ham to make a heartier soup chowder. 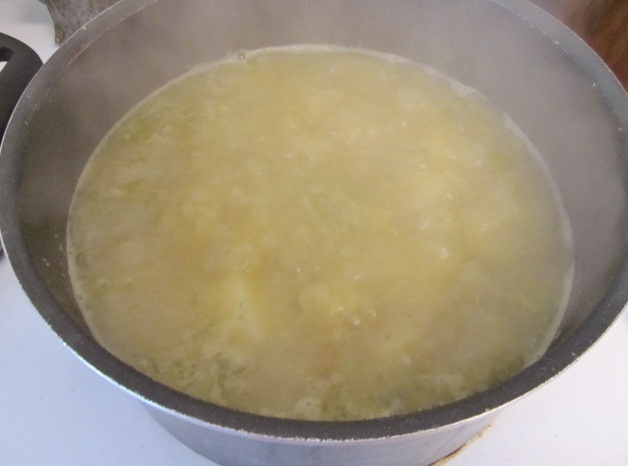 Bring a large pot of water to a boil, add potatoes and boil until fork tender. Drain, reserving 2-3 cups of the water. While potatoes drain in a colander, cover the bottom of the pan with with EVOO and warm over medium heat. Add onion and cook until they begin to soften. Add garlic and cook for another minute. Add the vegetable stock or chicken broth to the pan, and bring to a soft boil. Stir in the green chiles, salt, cumin and coriander. Reduce to a simmer for about 5 minutes. Return potatoes to the pot and stir. Add reserved potato water, 1 cup at a time until potatoes are covered. Stir in Worcestershire sauce, cilantro and pepper and simmer another 5-10 minutes. Remove pot from heat. Add butter, if using. Use an immersion blender to blend the soup to desired consistency (or pulse in batches in a blender). Our family likes a few chunks, so I don’t blend it very long. 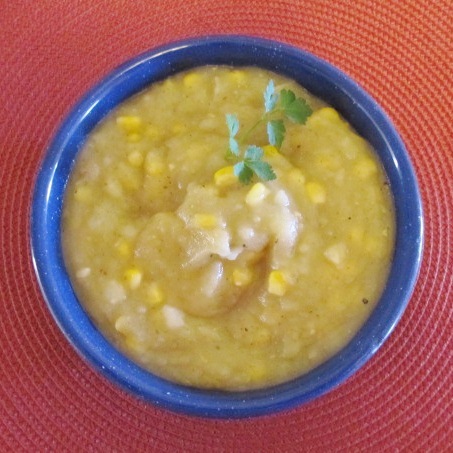 Stir in the corn and lime juice and let simmer for a few minutes to heat the corn. 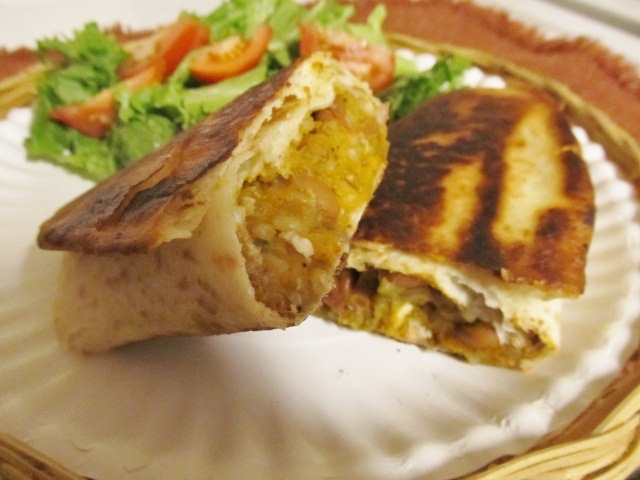 Serve with some crusty bread or warmed tortillas. 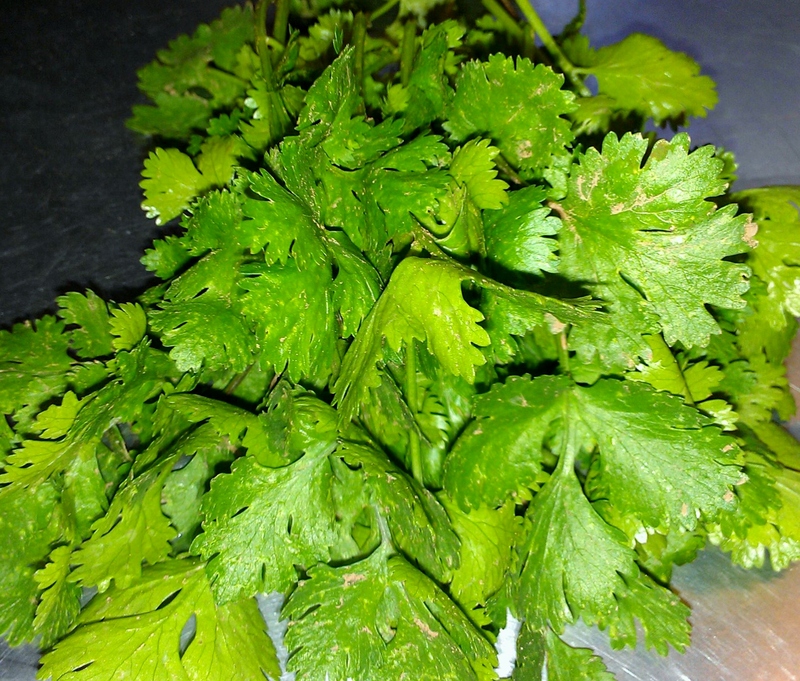 Garnish with some parsley or cilantro. Great soup chowder the next day, but you may need to add more stock or water to thin a bit as the potatoes continue to soak up the liquid. If you want a little more creaminess, you could add more butter or even some milk and blend into the mixture. When the soup chowder was almost finished, I realized I should have included some little diced carrots, which would have added some nice color, but also even more texture and flavor. 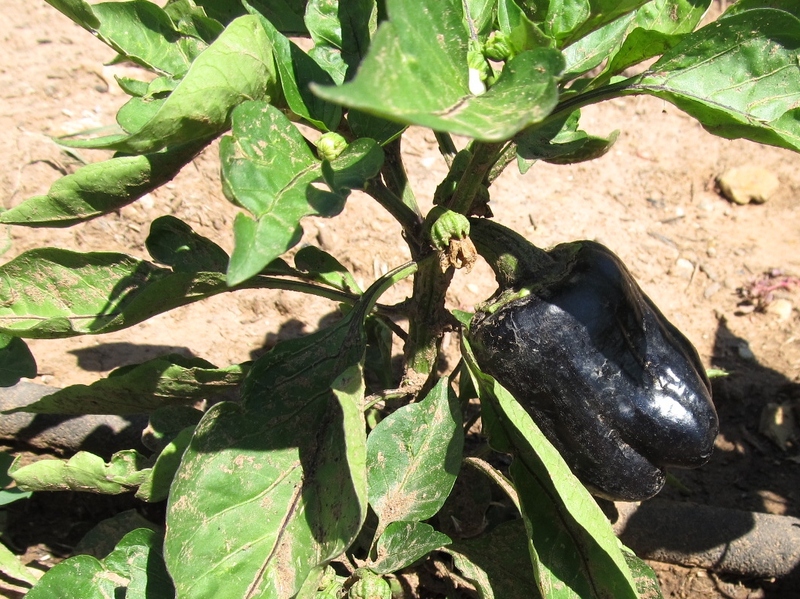 I think I might also play around with adding other peppers – a jalapeno, maybe, or a sweet red bell pepper. Also, I might play with the spices by adding some chile powder or a smidge of chipotle in adobo. Another twist might be to throw in some diced tomatoes, but that might change the chowder back to soup. 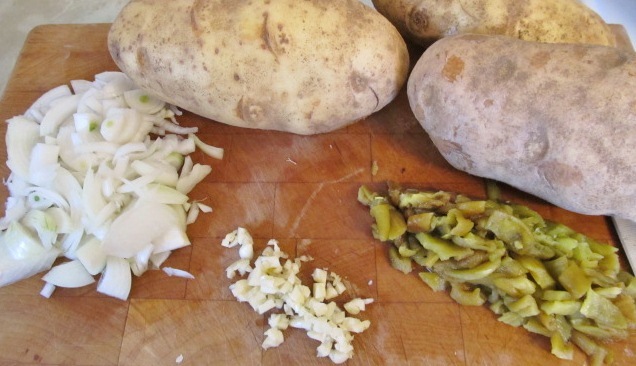 Leave a comment and let me know how your soup chowder turns out. Carrot & Sweet Potato Soup – orange you ready for some soup? Categories: Cooking, Dinner, Soup, Veggies | Tags: cilantro, Cooking, corn, Fall, food, Harvest, Hatch green chiles, healthy, low-carb, low-fat, Mexican, potatoes, soup, Southwestern, spicy, Vegetarian | Permalink. It’s that time of year when squash is taking over our gardens, kitchens and every other available corner of our lives. 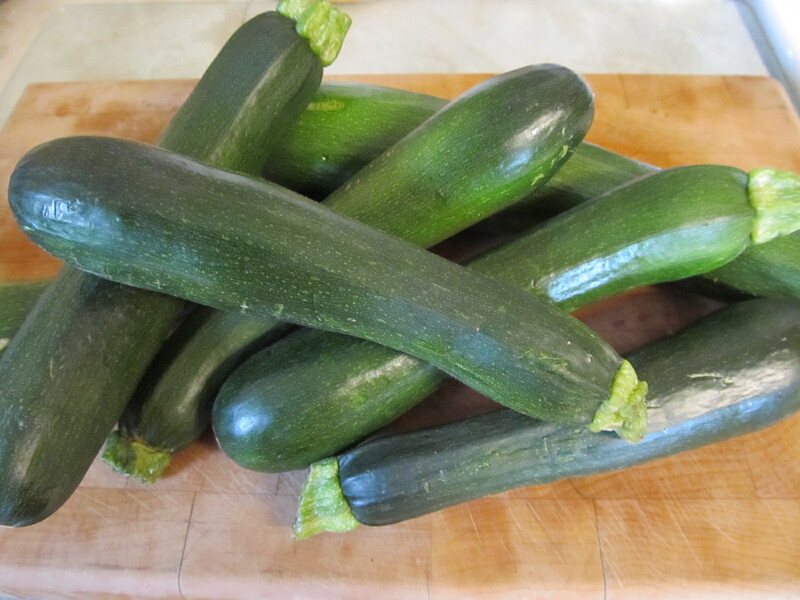 It’s great that it’s so easy to grow, but after you’ve made 88 loaves of zucchini bread, it’s time to change things up a bit. 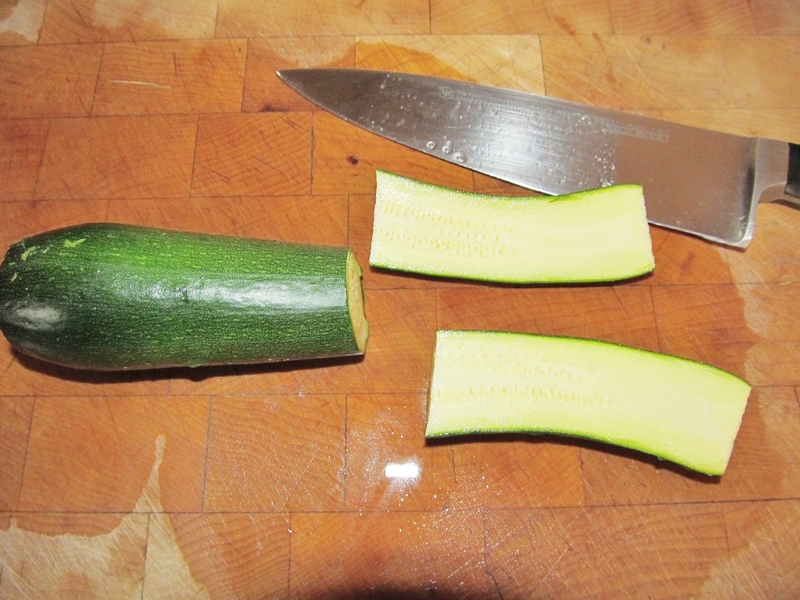 Zucchini is a very versatile veg, so you can really put it in most any recipe and it’ll make a great addition. My friend Mary even made a zucchini cobbler for book club once and it was way yummy (it was actually sweet, not savory). I have a speedy weeknight, one-pot wonder of a zucchini meal for you that the whole fam will devour. When I first started growing zucchini, my husband kept talking about something his mom used to make with zucchini, corn and cheese. He called it calavacitas, but in doing some research, it looks like calabacitas and calvacitas are the same basic dish – each family just has their own way to say it. The beauty of it all is that there are many versions of the old-school dish, so we can tweak it however we want! 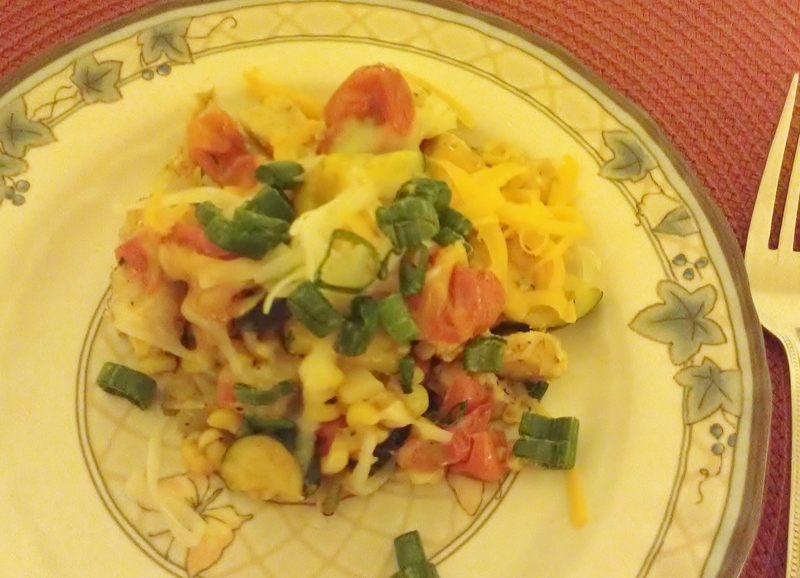 I also use the zucchini, corn and a little cheese, but I add a few more ingredients to make it more of a main dish. I use chicken as the protein, but you could swap that out for pork, ground beef, or shrimp – or you could leave it out and make it a vegetarian meal instead. It is really fast to throw together and it’s one of those recipes where you can sub out any ingredient you don’t have for one you do have and get dinner on the table in less than 30 minutes. 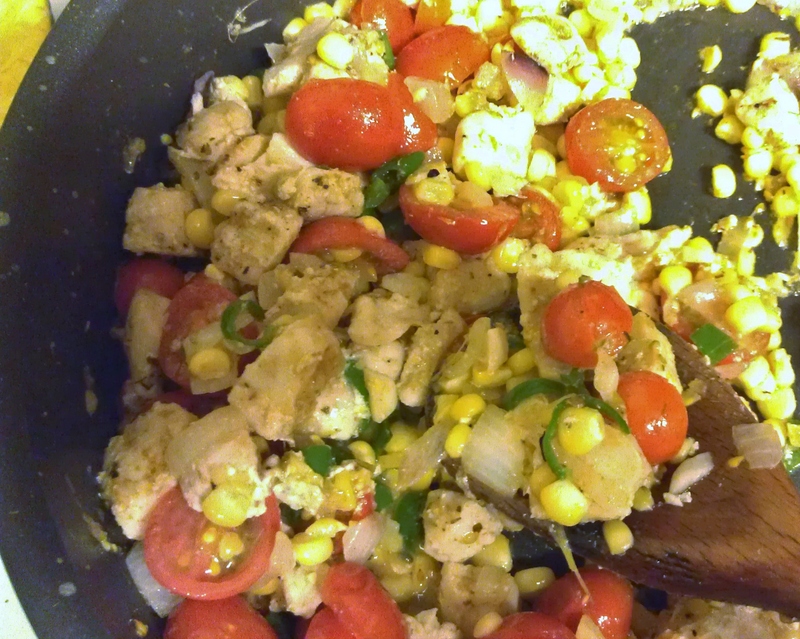 Simple one pot Mexican Succotash! Start by dicing the chicken into bite-sized pieces. I used some chicken tenders (about 3) I had in the freezer, but you could use breasts or boneless, skinless thighs also. The meat is easier to dice if it is still about half frozen. 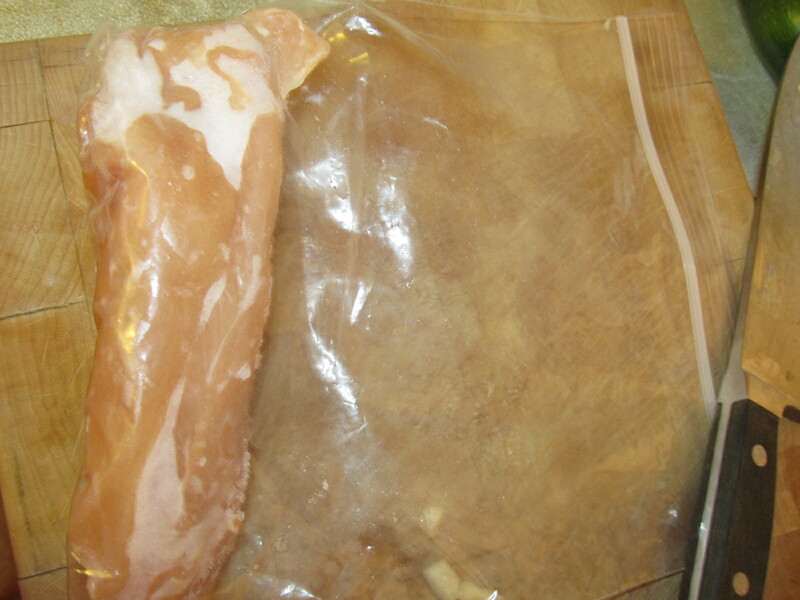 I buy a large package of chicken tenders when they’re on sale and then freeze smaller portions to pull out as needed. While you’re dicing the chicken, heat a large saute pan to medium heat. When hot, add a few swirls of EVOO and let it heat up. 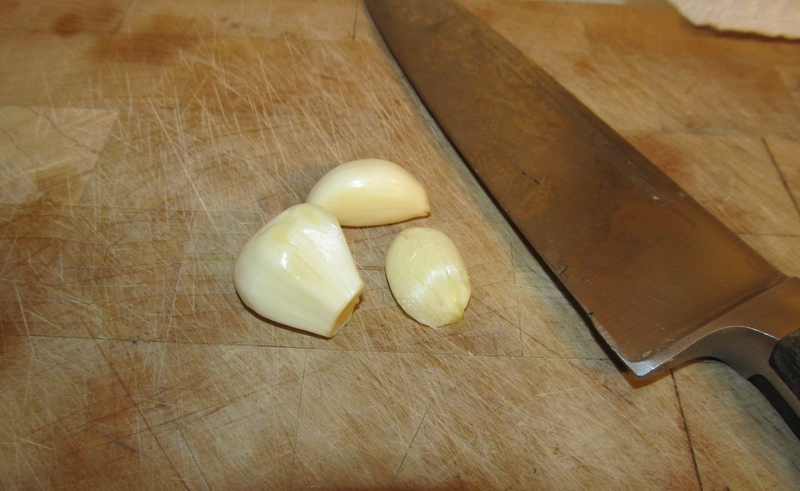 Add 3-4 cloves of minced garlic to the pan and cook for a minute – be careful not to scorch it as burned garlic tastes really bitter. Chop up about a quarter (or more, if you like!) of an onion and add to the garlic. Now add the corn. If you have fresh corn on the cob, just slice it off the cob straight into the pan. I used two cobs in mine. Once the corn gets a little sear on it, place the diced chicken in the pan, along with some salt and pepper. Sprinkle in about a 1/2 tsp each of cumin and Mexican oregano. Stir and simmer over medium heat. I have a lot (a ton) of these little green peppers – we think they’re Sandias – so I chopped up a few and threw them into the pan. You could use bell peppers or whatever type of pepper you might have on hand – or just skip if you don’t. We received a mystery pepper plant from a friend that we think is a Sandia pepper and it’s very productive, so I threw some in for some flavor. Next, add some chopped tomatoes, and/or salsa. I had some (or about a thousand) cherry tomatoes and some fresh salsa so I added some of both. Use what you have on hand. If you think you’ll need a little more heat, throw in some red pepper flakes. Throw in some tomatoes and/or some salsa and let it all simmer together until the chicken is fully cooked and tomatoes are softening. 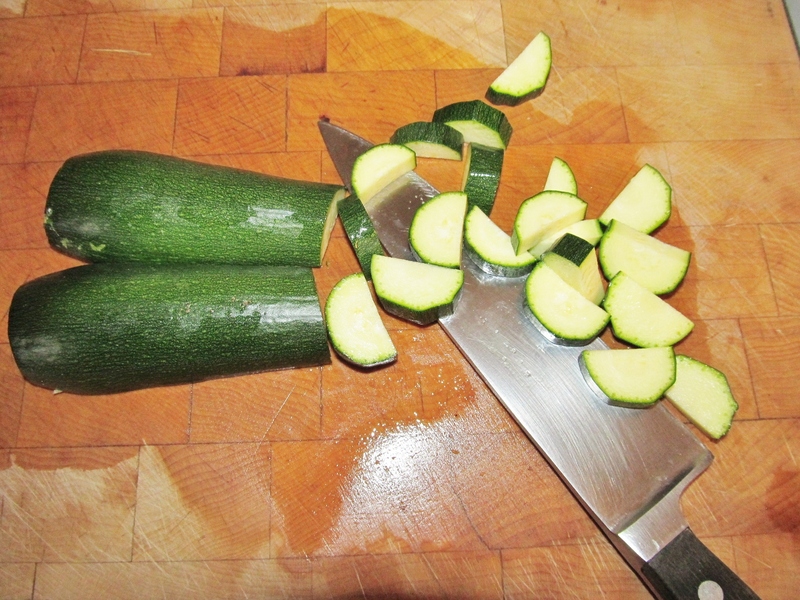 Then continue by chopping the zucchini (or yellow squash) – I used about two regular sized zuccs to feed two of us. Add more for a larger group (or to use up more of your harvest). 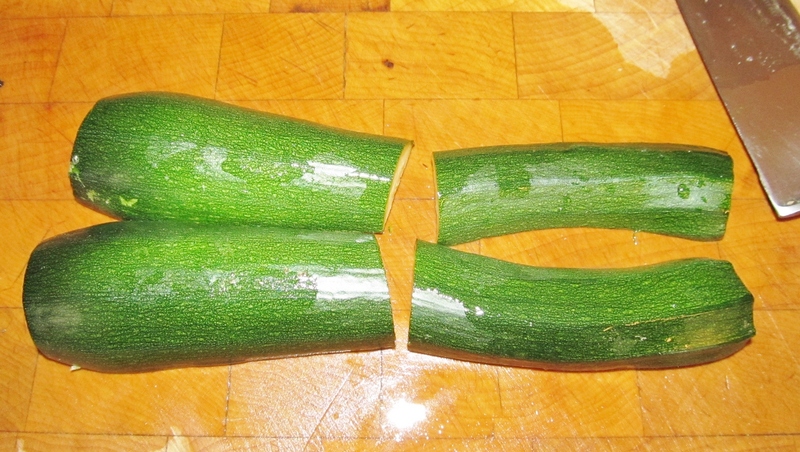 Slice the zucchini in half, then slice each half horizontally. Add the zucc to the pan and stir into the mixture. Cover and simmer for about 3-5 minutes. Watch the zucc, though, because you don’t want to let it get overcooked and mushy. Add the chopped zucc and cover. Simmer 3-4 minutes. At this point, your meal is complete – well, the Hubs says it’s not complete until you add the cheese! 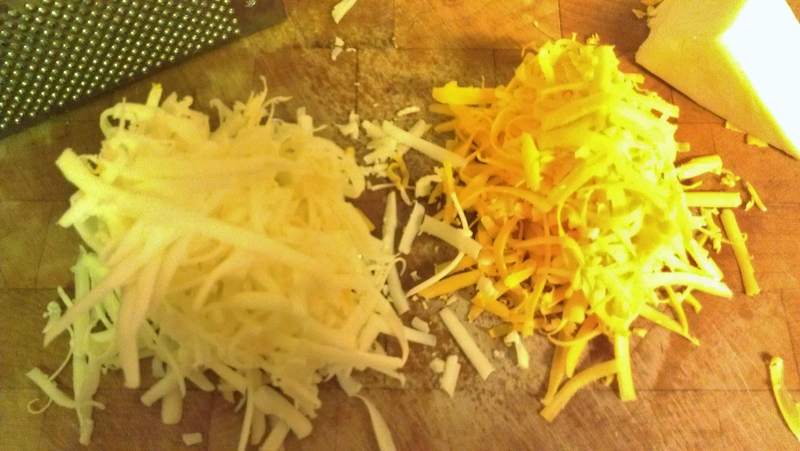 He likes a lot of cheese all mixed up and melted in the pan, but since I’m on the healthy kick, I shred a little on the side so we can each add as much or as little cheese as we like. Garnish with some green onions and/or cilantro and you’re ready to eat! Can it get any simpler than that? If you have other veggies you need to use up, go ahead and throw them into the pot as well. I think some diced potatoes or some green beans would be a happy addition – and would add a little more bulk if you’re trying to stretch the meal a little further. I could also see beans – maybe pinto or black – rounding it out nicely, as well. 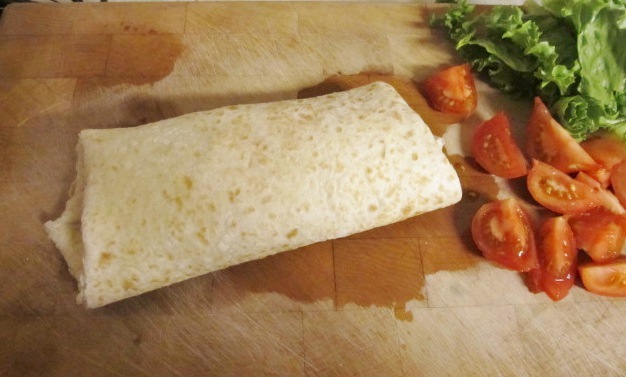 You could also wrap it up in a corn or flour tortilla to make it more kid friendly or portable. 1. Heat a large saute pan over medium heat. Add a couple of tablespoons of EVOO to lightly coat the bottom of pan. 2. Add garlic, saute for 1 minute then add onions. Saute on medium heat, stirring occasionally. 3. Remove corn from the cob and place in pan with garlic and onions. 4. Stir cumin and oregano, along with salt and pepper into the mixture. 5. Once corn is beginning to sear, add diced chicken to the pan. 7. 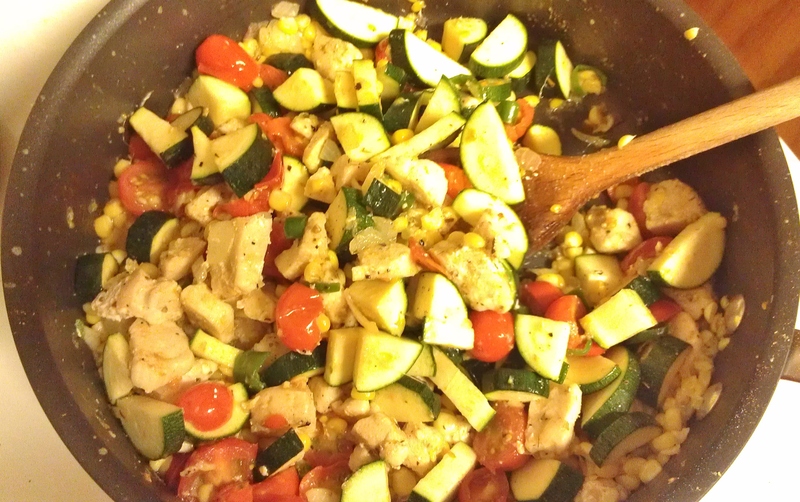 Add diced zucchini, cover and cook 3-5 minutes until zucchini is tender but not mushy. 8. Remove pan from heat and stir in cheese, if including it – or use as topping for individual portions. Garnish with green onions, cilantro and red pepper flakes to taste. Notes for next time: The Hubs liked this version of his childhood favorite and endorsed the addition of the chicken. He said I made it a little spicy for him (perfect for me), so taste before adding extra heat with peppers. I will make with shrimp next time (when I’m home alone) because the Hubs is weird about shrimp mixed into other food – he likes it on the side (??). Otherwise, I might also add some beans next time. I would love to hear your spin on this old, new again classic. Need other zucchini recipes (who doesn’t?)? See my squash board on Pinterest. 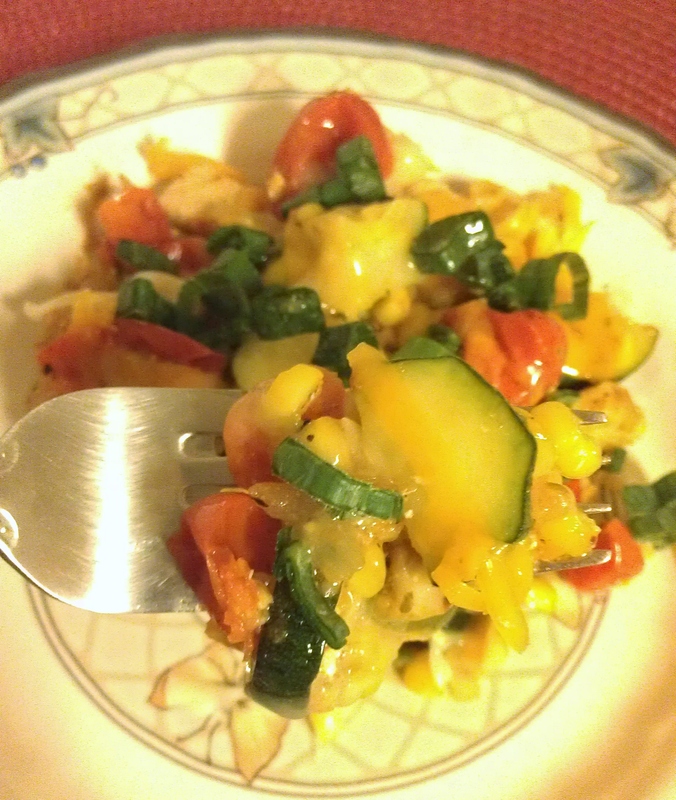 Categories: Cooking, Dinner, Sides, Veggies | Tags: cheese, cilantro, Cooking, corn, Diced Tomatoes, easy, easy recipe, fast, food, Fresh, Garden, gardening, garlic, Grow, healthy, homemade, ingredients, low-carb, low-fat, Mexican, nutrition, onions, peppers, recipes, simple, spicy, squash, tomatoes, vegetables, zucchini | Permalink. Since it’s late August and I’m just getting started here at Cooking Ripe! I thought I should catch you up on how the garden grew this year. We’re in full harvest now, so you’ll see the fruit of the labor in the kitchen in future posts. We have a large lot, and tons of mostly flat space out back, but I have only had one tiny garden back there previously. It was so tiny that the Hubs and I cleared it and turned it by hand (and backs) last year. This year, I called in my friend with mini-tractor to ‘disk’ it, as the farmers here in SW Colorado say. I had another friend bring a load of sheep manure from his farm to mix into the clay soil. Due to a timing error on my part, I hand spread the manure myself. Then in late April, I planted the right-hand side with early season crops: potatoes, lettuce, spinach, onions, peppers, carrots and garlic. I tell you more specifics about the varieties I planted later. About a month later, I finally had time to get the second half planted. I added cilantro, basil, peppers, more garlic and onions, squash and my first ever tomato plants. Over the next few weeks I watered and watered and fretted over what wasn’t happening: the cilantro and basil weren’t appearing on schedule. Fearing I would be watering expanses of empty dirt if I didn’t fill in along all of the soaker hoses, I added few plants from a local greenhouse: replacement cilantro, Thai basil, broccoli, and cabbage. I filled some other gaps with leftover green onion seeds and carrots. (Meet our kitty, Kow. 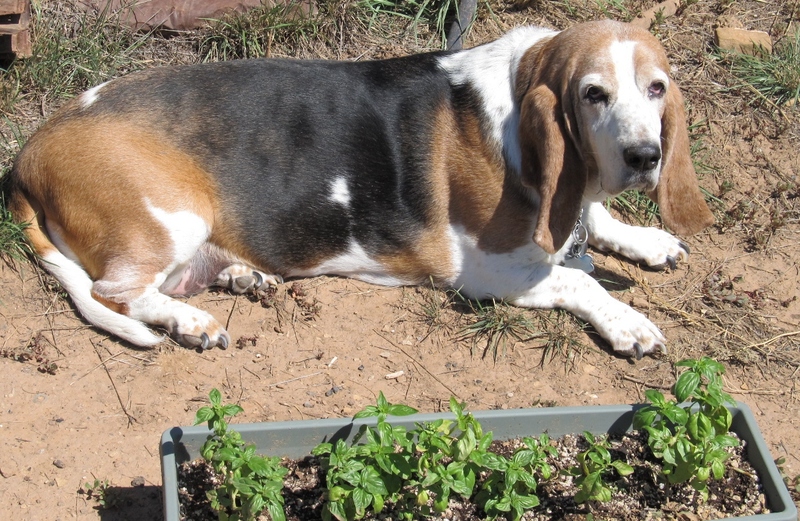 She supervised the gardening, especially the carrot plants, until she passed away in late July. RIP sweet kitty). 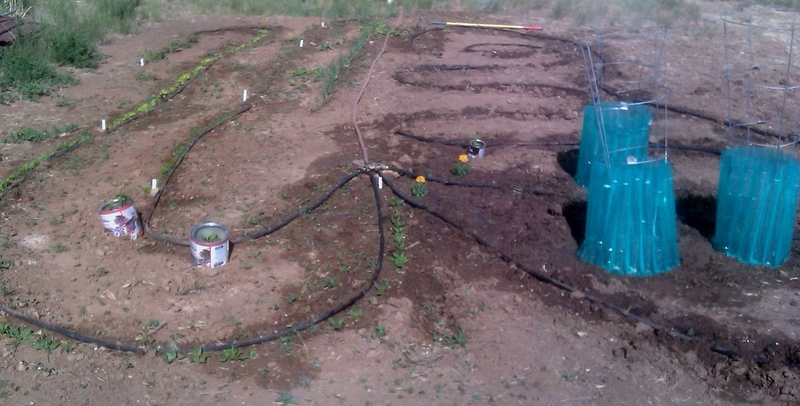 Third week in June 2012 – everything’s planted. 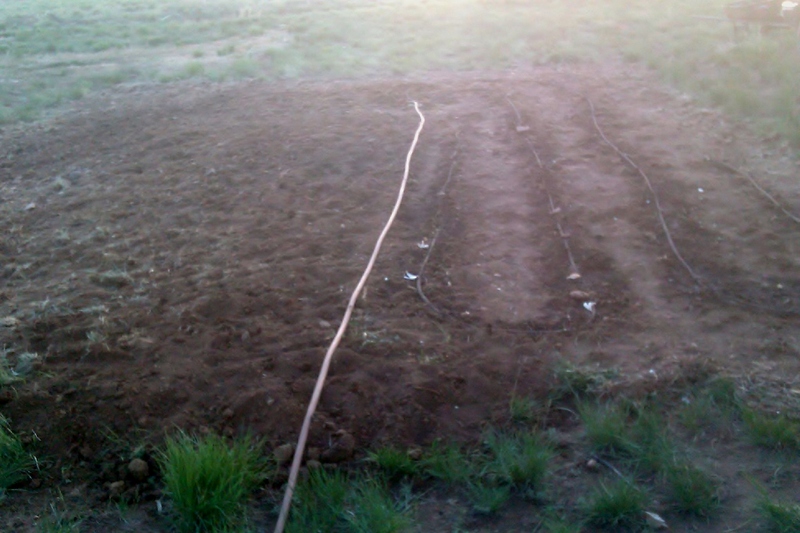 As the watering continued (and the weeding began), I noticed many sprouts that I did not plant. I knew the lazy composting (throwing my kitchen scraps out in the garden area all winter) was the culprit. I figured it was some sort of squash or melon, but nobody seemed to be able to positively identify the various volunteer sprouts. I decided to leave some, move some and (gasp!) pull some up. 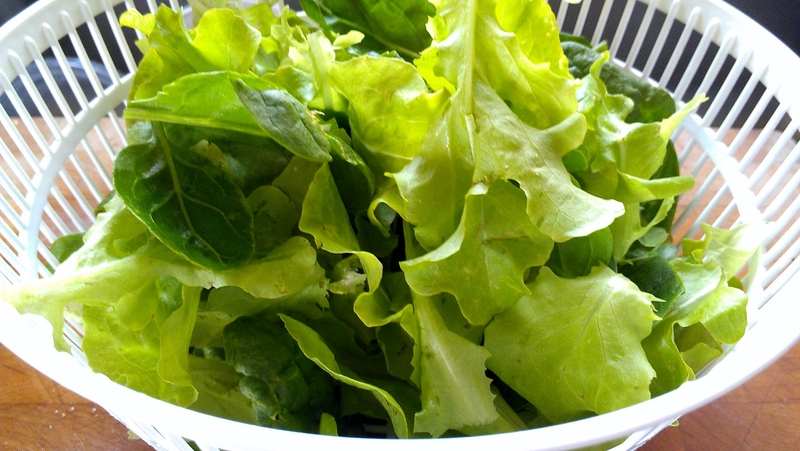 By early June the first payday: fresh cut LETTUCE! Isn’t it pretty and crispy? We had salad almost every day through most of August! There’s nothing simpler than going outside with some scissors, cutting a bowl of greens, washing them up and eating them with some homemade dressing (yes, I’ll show you how easy it is to make later!). First of MANY lettuce cuttings! While we sometimes get freaky snowstorms in June, this year was not cold: it was blistering hot for a few weeks. Coupled with crazy windstorms and no rain, I was afraid my delicate plants would wither or blow away. But, the heat broke on the 4th of July when we got some much needed cool air and a little rain. We also got our first carrot. By mid-July the garden was starting to produce regularly. We were eating lettuce daily and had fresh carrots and peppers as often as we wanted. The cilantro was ultra-productive and the basil was looking and smelling heavenly. 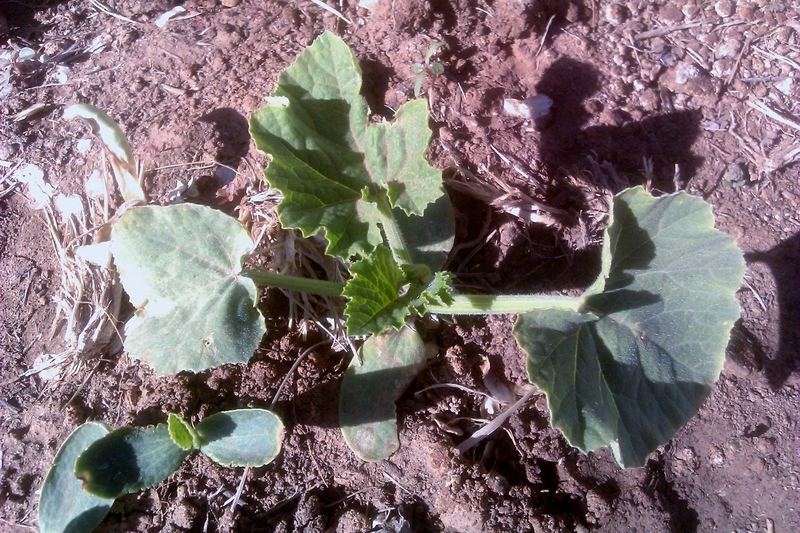 By the end of July we were finally able to positively identify the mystery squash. We have a mini-pumpkin patch and a mini-cantaloupe patch. 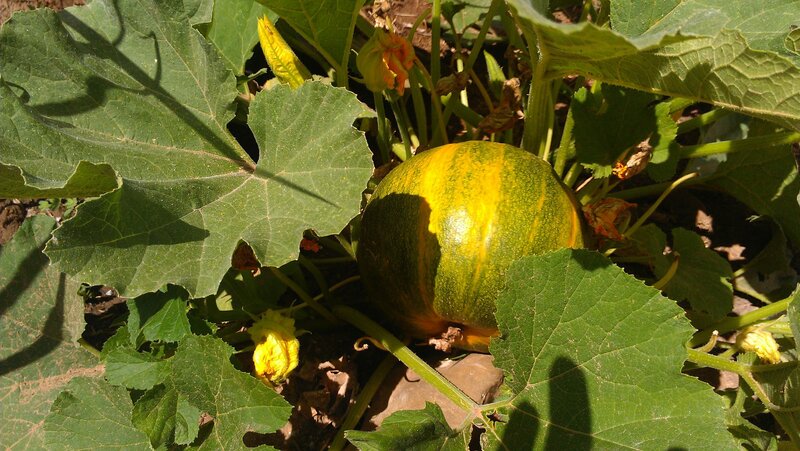 We are excited to see how the melons turn out, given our altitude (6,800 ft). Here’s one of the pumpkins. 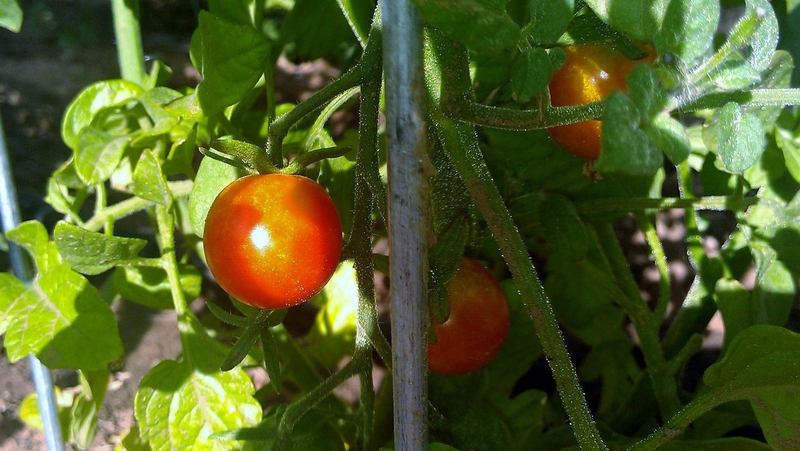 My very first ripe tomatoes – ever! I had never tried to grow tomatoes before, so it was oh, soooo exciting to see some red beauties hanging out on the vines. By the first week in August, we were really in full swing! We had green onions, zucchini, tomatoes, pepper, carrots and I started freaking out about keeping up with the harvest. It’s hard for two people to eat all of those veggies, but I did my best to find recipes to use up what we had so we didn’t waste. Also, since all of friends have gardens, it’s hard to give away the extras. 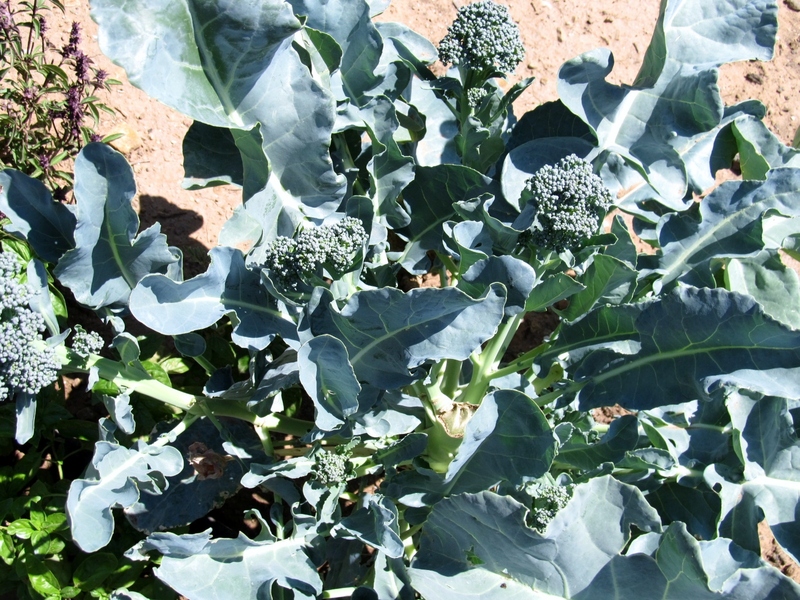 Just eat your veggies – or freeze them! One of those extras I added from the local greenhouse was eggplant and has been the surprise hit of the year! The plants are really pretty and the eggplant is super yummy and not bitter like the ones in the store. Even the Hubs says we should grow more next year. I will share my favorite eggplant recipes soon! By mid-August, we started cutting basil (pesto recipe also coming soon) and pulling a few onions. Aren’t they pretty? 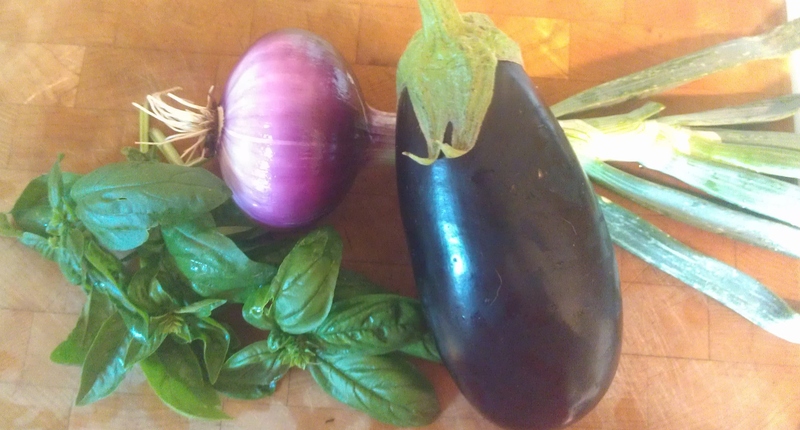 Mid-August basil, onions and eggplant! When the garden gives you tomatoes, onions, peppers, garlic and cilantro you HAVE to make fresh salsa! 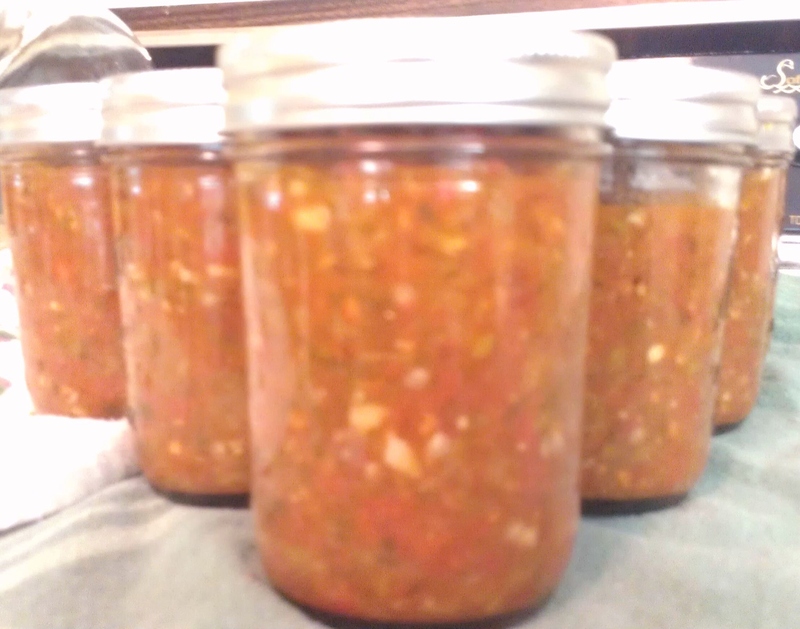 I’ve made salsa in the past, but this was my first time canning it – and it was pretty simple. I’ll show you the next time I make some. Fresh, homemade salsa: first canning project! 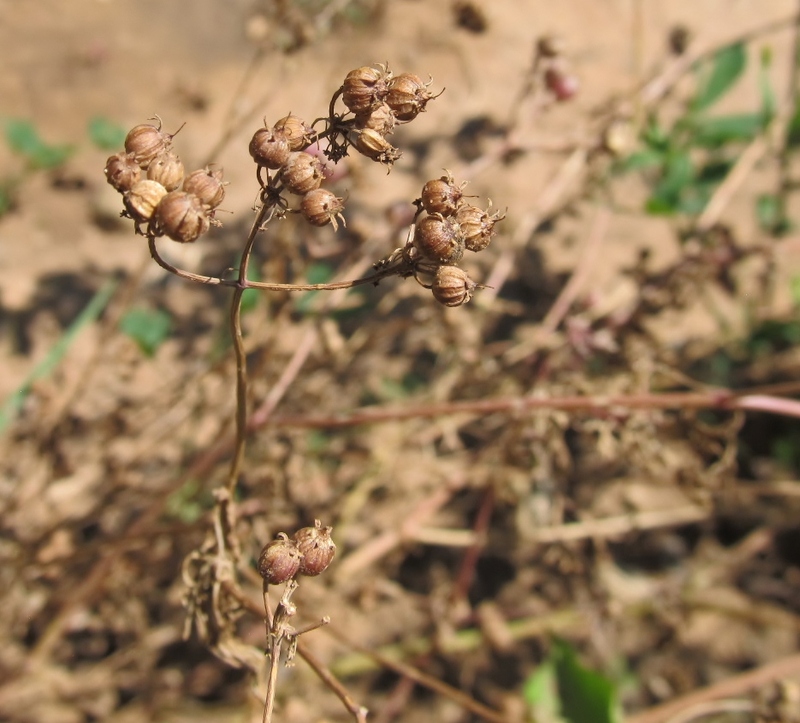 By late August, the lettuce and cilantro were going to seed (did you know coriander is the seed from the cilantro plant? I didn’t but do now! 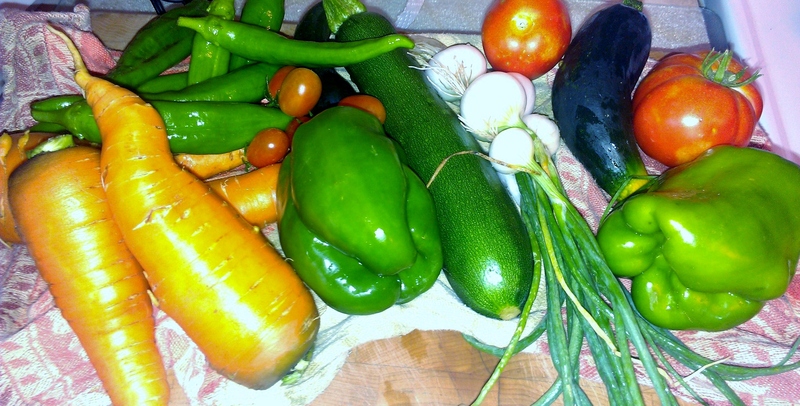 ), but the tomatoes, squash, carrots, peppers, eggplant, broccoli and onions are still rocking. Soon we’ll dig and cure the onions and garlic for winter storage. We are still waiting for the pumpkins and cantaloupe to ripen, but I think we’re getting close. Potatoes are not looking great, but we’ll have a few itty bitties. Oh, and we have one monster cabbage still cooking out there. Can’t wait to cut that head and cook it up. The Hubs loves cabbage! So, this brings us to date with the garden. While it’s starting to wind down, we have lots to eat and preserve still. I hope we can get it all done! Categories: Garden | Tags: basil, canteloupe, carrots, cilantro, Cooking, coriander, eggplant, Fresh, Garden, gardening, Grow, onions, peppers, potatoes, pumpkins, soaker hose, spinach, tomatoes | Permalink. Caramelized Brussels Sprouts – with BACON!